Producing a sound that is full and dark instead of thin and airy is a turning point in every trumpet player's development. Improper breathing technique combined with underdeveloped lip muscles can create an undesirable trumpet sound. Focusing on embouchure and using the correct amount of air can have immediate effects on a trumpet player's sound quality. Every aspect of music takes time to perfect, but by changing a few habits a novice player can have the full sound he desires. Take a deep breath in. You should feel your stomach getting larger, not your chest. Always breathe this way before playing your instrument. Buzz your lips as if playing but without your instrument against them. Focus on creating a fast airstream that is small in diameter. Make sure there is no air leaking through the corners of your mouth. Remove the mouthpiece from your trumpet. Play a sustained note through it with constant sound for as long as possible. If the note you are producing often changes in pitch or it fluctuates in volume, your airstream is not ideal, in which case, repeat step 2. Play long tones on your trumpet. Insert the mouthpiece into your instrument and play a long, sustained, middle G. Keep the air moving quickly through the instrument by tightening your abdominal muscles as you play. Producing a quality tone on a mouthpiece is much more difficult than on your trumpet, so through practice you should see a large improvement in the sound coming from your instrument. To develop the muscles in your lips, try buzzing while doing other tasks such as showering or driving. Relax the muscles in your neck and shoulders while playing to allow more air to flow through the instrument. Don't press the instrument into your lips. 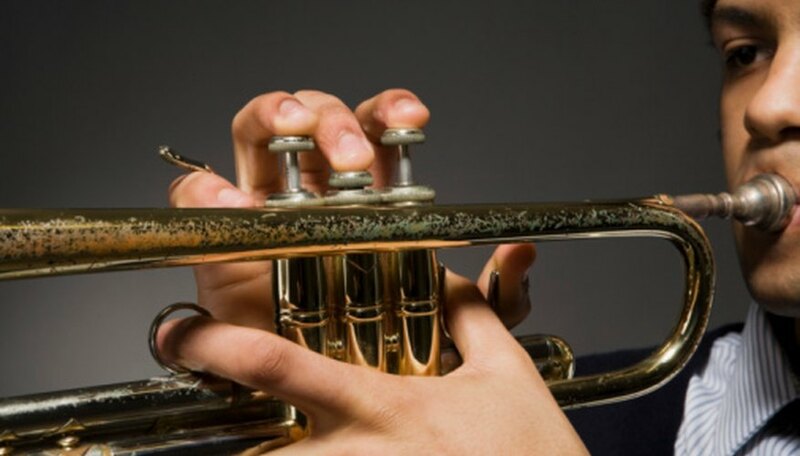 Many novice trumpet players tend to do this in order to play higher notes; it can damage your teeth. Justin Saglio graduated from the University of Massachusetts where he received dual degrees in journalism and history with a minor in international relations. He worked as a multimedia reporter for Masslive.com, a news source for western Massachusetts.